Hello Little Sunshine - Singapore Parenting and Lifestyle Blog: Cronuts - where to get your fix in Singapore! 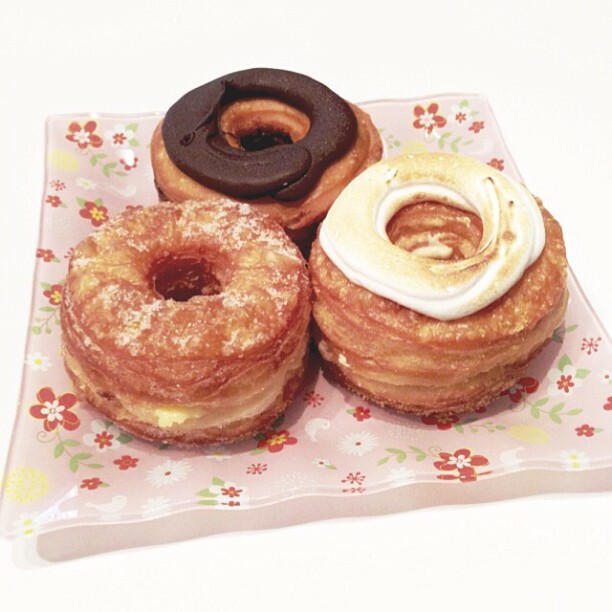 Cronuts - where to get your fix in Singapore! By now, you would probably have heard about Cronuts - part croissant, part donut. Yes, you heard me right, such an amazing pastry actually exists thanks to French pastry chef Dominique Ansel of Dominique Ansel Bakery in NYC! Customers wait as long as five hours just to get their hands on these croissant-doughnut hybrids and each person is limited to purchasing two Cronuts, while the limit for pre-orders is six. It has caused such a craze that even Heidi Klum flew a box of these yummy pastries on her jet plane after waiting weeks to try it, and actress Emma Roberts was said to have tried to cut the Cronut line and got rejected. There's even a black market where Cronuts are sold at up to $40 for a piece! Now, when I heard about the Cronut I have to admit that for a split second I did think of flying to NYC just to try the Cronut. I know I sound insane, but "doughnuts make me happy" (I quote what I said six years ago to two friends who burst into laughter and thought I was pure retarded), and honestly if even celebs are trying their ways and means to get it..it's got to be worth the trip. Obviously, it was just a thought..and the next smart thing I did was to google if there were any bakeries in Singapore that were selling it...and yes there are!! Goes by the name "Crodos". Retails daily and each piece retails at $4.90. The Crodos come in two flavours, a sugar coated one filled with pastry cream, and the other is chocolate. Known as the "Really Good Donut". Retailing at $2 each, these squared shaped donuts are rolled in cinnamon sugar and filled with vanilla bean pastry cream. Available only on Thursday and Fridays from 10.30am - 2pm. The "G nuts" retail at $4 each and come in Lemon, Chocolate and Salted Caramel flavours. They are also smaller in size compared to the real Cronuts, and the Crodos from Da Paolo Gastronomia. I've only tried the Crodos from Da Paolo Gastronomia, and I'm so happy that they are still around! Every month they've a special flavour, for August it was Lemon Meringue, and this month it's...*drum roll* Salted Caramel! Ever since the first time I got some to try, Daddy Li and I have gone by to Da Paolo at least three more times to get our Cronut fix, and uh that's us together..which means to say I've not counted the the times I've gone out on my own to get some to surprise the man or just cos it's "in the area". Yes, even the man likes it. Just so you know, it's not easy to please Daddy Li's tastebuds, so well you know..if he likes it so much it's really that good. Personal word of advice: Get your Crodos in the morning before they run out, especially on weekends. The most popular flavour is the sugar coated one filled with pastry cream, and in fact it's our favourite flavour as well! Happy eating..trust me, it's so worth the calories!